Waking up at the crack of dawn is never fun. It’s even less fun when you’re only up because your room suddenly got very loud, way before you alarm even went off. Morning traffic waits for no one. You may need to start looking into the best soundproof curtains for your room. Soundproof curtains can help you reduce the noise from outside of your apartment or house, making it easier for you to sleep in. Colors: You want your curtains to blend into your existing style, not stick out like a sore thumb. Keep in mind what kinds of colors will match well with your existing style so you can relax in a beautiful and quiet room. 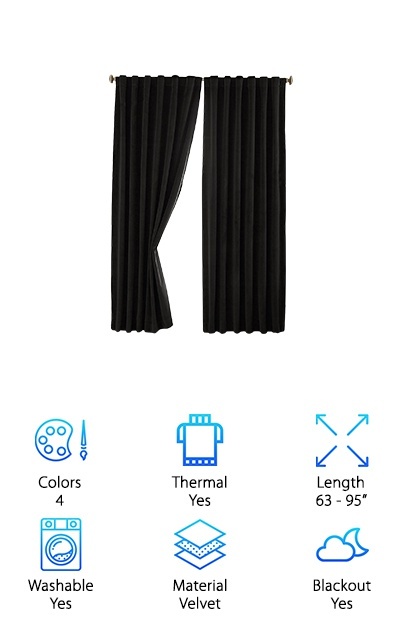 Thermal: Thermal curtains can help keep the rooms in your house warmer. They can also help to reduce your energy bill. Keep this in mind when looking at soundproof curtains. Length: Your curtains should look seamless in your house, so make sure that you choose the right length for your curtains. You can easily do this by measuring from a bit higher than your window to the floor. Washable: Some curtains have to have special cleaning supplies to maintain them. No one wants to have to worry about how they clean their curtains, so look for this washable icon to get curtains that are machine washable. Material: The material plays a big part in how these curtains function. Some are made of cotton or velvet but most are made of polyester. Polyester is a great all-purpose fabric that allows curtains to be washable. Blackout: For total relaxation in a bedroom, curtains can completely block out light from the room. In common spaces that no one sleeps in, blackout curtains may not be necessary. So now that you know what to look for, you’re one step closer to relaxation. If you really want to get back to that nap, just check out our top and budget picks. They’re our best bets for curtains that you will love and that will effectively block out noise. If you have some more time, make sure to check out our other eight picks. They’re all great options for choosing a great set of curtains. Our top pick for some of the best sound blocking curtains is these amazing Moondream Soundproof Curtains. These curtains have it all. They come in a variety of colors- white, beige, Darjeeling, eggshell, dark beige, chocolate brown, long brown, ash grey, cloud grey, pepper, garnet, and morello cherry. There’s certainly something for every household. These curtains are not only soundproofing, they are both thermal and blackout as well. This means nothing gets between you and your zzz’s, not cold, not light, not even the sound of morning traffic. They come with rust proof grommets to make sure that they last you a long time. They also come in a variety of sizes, so you know they’ll fit your windows. They have a reinforced top section that is made without stitching for a better overall look and feel. They are easily adjustable to the height and size of your windows. 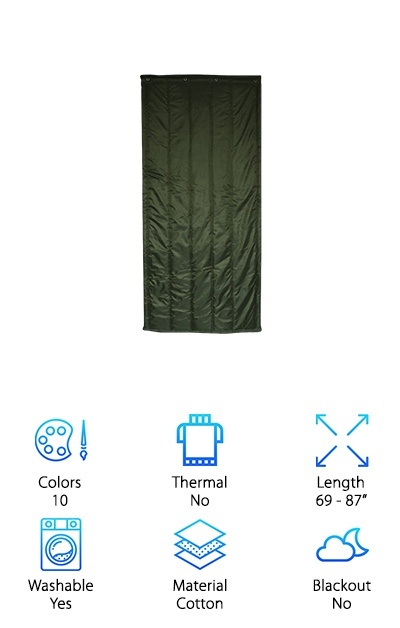 In short, this is the best soundproof curtain for sale right now! These curtains are a great choice for anyone looking for great blackout and soundproof curtains that don’t break the bank. They are made with a three-layer construction of sound dampening fabric, allowing them to block out sound, light, and heat effectively. They come in fifteen colors- beige, light blue, deep red, ashy brown, lime green, dark grey, black, pale pink, royal blue, olive, silver, deep purple, white, coffee, and turquoise. You know they’ll fit right in in your home, regardless of what room you have in mind for a warm, soundless sanctuary. 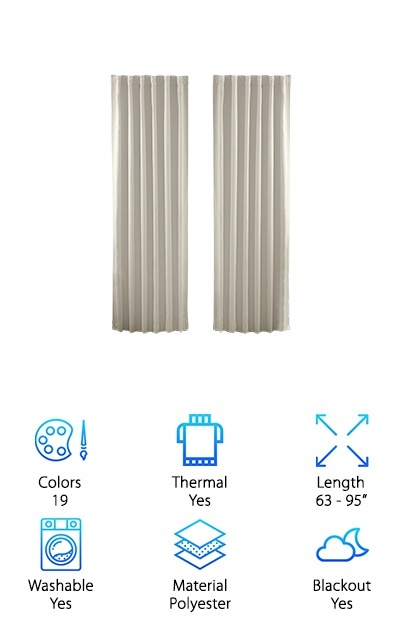 They come in two sizes, so you don’t have to worry about the length of your windows. They are even machine washable, so maintenance is easy and hassles free. These curtains allow you to easily nap in any room of the house, knowing they are blocking sound, light, and heat without creating any extra hassle for you. They also provide lots of privacy. These are great curtains for anyone looking to create a lush and luxurious feeling in their home. These velvet curtains block light, heat, and sound, allowing you to relax in style and comfort in your home. They are ideal for anyone who wants the look and feel of an old-timey theater in their house, as all these lush velvet curtains are missing is a gold tassel rope at the end to complete the look. They come in four colors- black, light brown, coffee brown, and stone blue. These curtains block 100% of light and allow for maximum privacy and noise reduction. Watch your favorite movies in style, without having to worry about your nosy neighboring glaring in your windows trying to watch along. These curtains transform any room into your own personal home theater, no matter the time of day. They are amazing blackout soundproof curtains for any room, not just your living room. 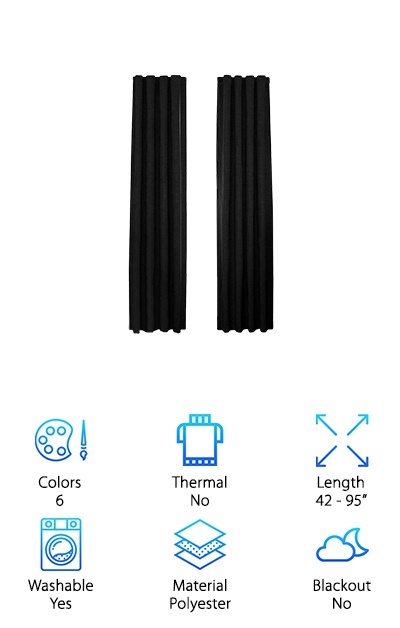 These are a great choice for anyone looking for stylish sound reducing curtains. They come in ten colors to fit any room. The colors are- silver, olive, orange, brown, bright pink, bright red, army green, royal blue, black, and scarlet red. These color options make these curtains a great choice for anyone looking for something that they can match throughout their house without matching a color exactly. 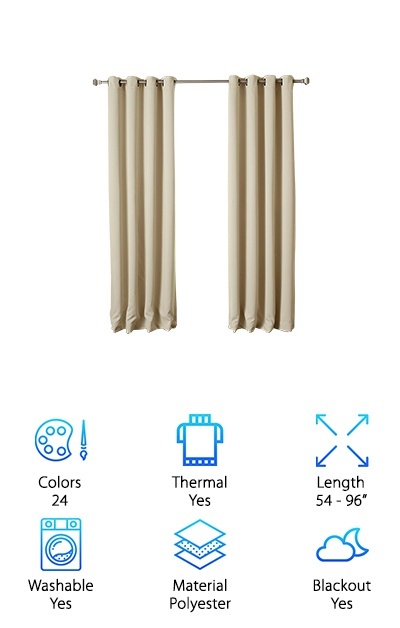 These curtains are made of a thick cotton material. They can be used as curtains or as a partition between rooms. 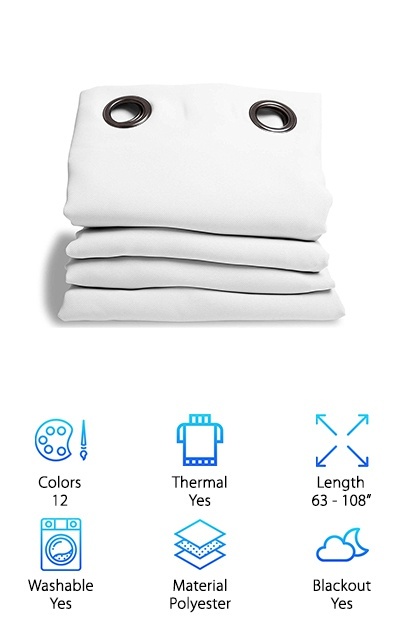 They are even machine washable so you’ll never have to worry about the hassle of having them cleaned or figuring out how to clean them yourself. Just throw them in the machine. They are very thick, so they’ll be able to keep your room warm and cozy without being thermally rated. This gives them a budget friendly side. They only weigh about 3.3 pounds shipped, so they are not so heavy you will feel suffocated in your room. This is a great choice for anyone who needs something close to industrial soundproof curtains to keep the peace in a shared space. They make a great room divider, providing a great way to keep things separated. They come in seven sizes, so they’re sure to fit any room or space. They also come in eight different colors to provide a fit for any style. The colors it comes in are- beige, black, cappuccino, grey, greyish white, navy blue, toffee brown, and warm beige. These colors are sure to go well in any space. This package comes with one curtain, perfect for a room divider. They are easy to maintain, as you can just throw them in the machine on a cold cycle to clean them. They provide sound and light insulation from the other side of the room to let you relax in peace. It is easy to fold and carry if you ever need to move this divider from one shoebox apartment to the next. This is a great choice for anyone looking for the best noise cancelling curtains for a nursery. Because the last thing you want is your baby waking up in the middle of the night because of some idiot who honks his horn right outside of your window. The fabric is constructed in a triple weave to block out anywhere from 90-98% of light and UV rays, which keeps your baby sleeping soundly and safely at naptime. These curtains come in an incredible array of nineteen colors- everything from eggshell to royal blue. They are machine washable to remove a little bit of stress when cleaning them. Just throw them in the machine on cold. The front and back of these curtains are the same material, so you can always just flip them around if you don’t feel like cleaning them (come on, we all do it). These curtains also insulate from heat and cold, keeping your room cozy and warm. If you’re perusing through our list of acoustic curtains looking for something that is just a single panel, this may be the curtain for you. 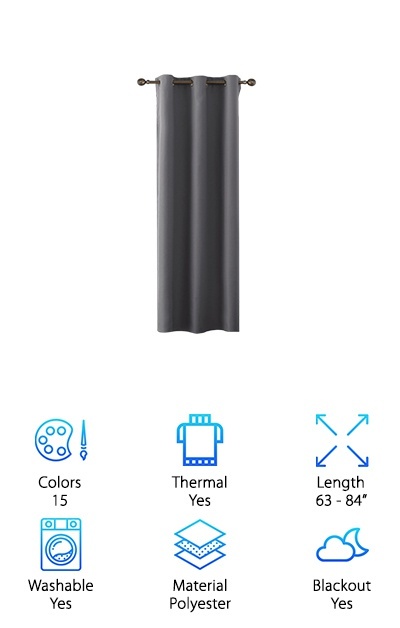 It comes with a six-inch rod pocket and back tabs for easy installation in any thin windows. They are very budget friendly, so you can even grab two for a bigger window at a potentially lower price. They are made of a 100% polyester material, which makes them machine washable. This means they are convenient and easy to clean. These gorgeous curtains darken your room so you can nap in peace and quiet. The panels offer a few hanging options so you can easily match its style to the style of your room. They also come in size different color options- black, grey, ivory, chocolate, blue river, and true black. These colors make it easy to match not only function but style with your room. These are fantastic curtains. These are great curtains for anyone looking great acoustical curtains for reducing noise. They reduce the noise in your room for a peaceful and quiet environment. They are also tested by Best Home to be 99% effective at blocking light from entering the room you put them up in. They are densely woven to provide thermal insulation from the outside world. These features mean they can help ensure total privacy for all of the rooms of your house. These curtains have a silky smooth feel, meaning they feel lush and drape easily to provide a luxurious and beautiful effect. They are made with triple weave technology that blocks heat, light, and cold without sacrificing on style. These curtains can be machine washed on warm as long as they are with similar colors. Panels should measure 2-3 times the width of your windows, so keep this in mind when choosing the width of your panels. This ensures they look full. These curtains provide a great solution for anyone looking for a soundproof curtains review of something that comes in lots of bright colors. 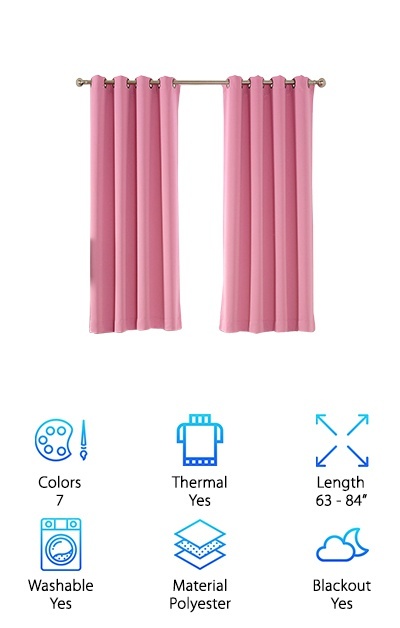 These curtains come in seven colors. They are- Barbie Pink, Beige, Black, Charcoal Grey, Grey, Light Teal, and Navy Blue. 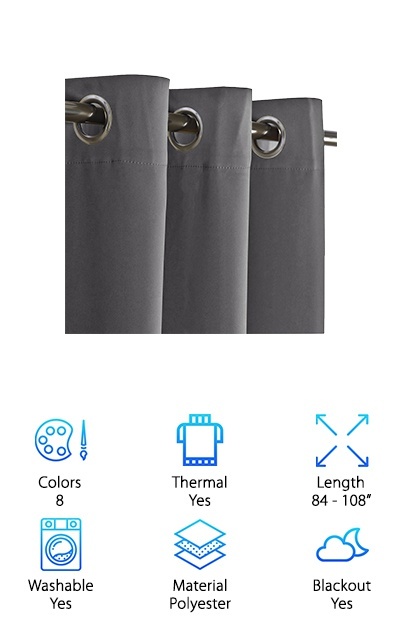 These curtains block out up to 98% of light when choosing a darker color, according to AMAZLINEN. The thermal element of the curtains allows you to save a little money on your energy bill as well. They can even be returned for a refund within 30 days if you don’t like them or if they don’t quite fit your room as you imagined. But these curtains are really a great choice for most people as they are great for kids rooms or for any other room of the house. They are made of 100% polyester so you can easily throw them in the wash if your child spills something on them. These are great room darkening curtains for anyone who wants a special effect in their room when the sun does come up. 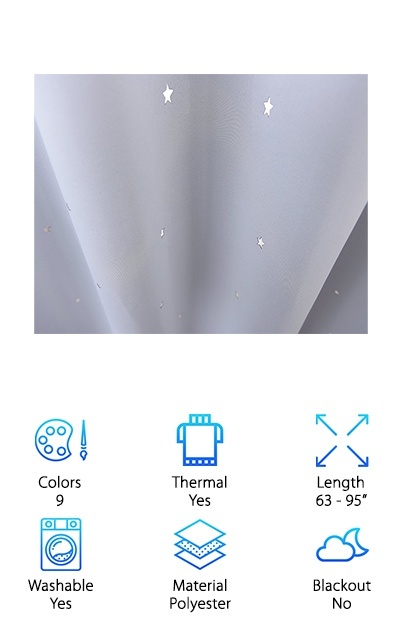 These curtains come with stars laser cut out as a cute little design element. If you’ve been scanning through acoustic curtains reviews searching for something truly unique, this is what you’ve been looking for. The die cut stars provide a fun and cosmic feeling in every room. It feels just like you are surrounded by stars. They come in nine colors- pale pink, grey, white, black, navy blue, turquoise, toffee brown, cappuccino, and vanilla, These curtains are a great choice for a kids room or for any room that just needs a little more fun added to it. The silver grommets at the top make these curtains easy to slide back and forth. They also make them very easy to install for any users. This means less time trying to put your curtains up and more time relaxing in a star-filled wonderland.